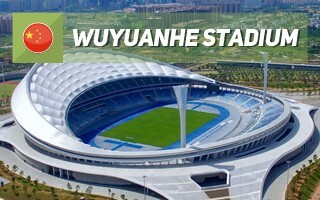 Yes, the stadium was intended to resemble a large wave moving from the west to the east and thus the unique shape. It has already hosted a number of football games but may be even better as an amphitheatre. The emergence of a brand new stadium in Haikou isn't just supposed to fill a lack of large event venue in the city and wider Hainan province. It's also part of a massive expansion of Haikou westwards, away from the traditionally inhabited parts. The stadium was integrated into a vast 28-hectare quarter between brand new avenues, which in the future will be joined by three more quarter with cultural and leisure venues. Just as impressive as its scale is the pace of construction. Work on this stadium began in March of 2017 and was complete just 13 months later. It consumed some 1.06 billion youan (or $157m), though it should be pointed out that the price includes all work delivered within the 28 hectares, including smaller training stadium, vast ramps welcoming visitors from four directions and extensive parking. Within the stadium 900 parking places were created, while up to 4,000 should be provided within walking distance. The stadium's form is very interesting as United Atelier decided to forego symmetry and harmony in order to create an imposing, dominant main grandstand. The stadium thus pays tribute to the maritime location, resembling a wave growing just beside the field of play. The effect is supported by seating colour, starting from bright blue and ending with deep navy where the auditorium hides behind the membrane roof. Fans in the uppermost rows can still see all of the field and track but not the opposite stand. Even by day these areas of the stadium are quite dark, though not entirely opaque. The main stand also has an interesting outer cladding, created with silverish, anodysed louvers. It provides both shade and good ventilation in the hot and humid climate oh Haikou, while also resembling a clam. With this unusual layout the stadium is drawn into a perfect circle with diameter of 280 meters and 60,000-square-mter footprint. Also, the layout enables use of just the west stand as an amphitheatre for over 20,000 people. Such use may prove useful because in its first year the stadium hosted more cultural events than large sports fixtures.